Somebody asked me about the file format of AutoCAD plot styles. I didnt have a direct answer, but a later hint from the same person helped me quite a bit further. This inspired me to create a CTB/STB view/print application that works completely independent of AutoCAD and Autodesk tools! The program consists of just one executable file, there are no other exes or dlls needed. It should work with CTBs/STBs from AutoCAD 2000 upto the latest version. The purpose of this tool is that you can view CTBs, print them and save as text file that you can open in Excel etc. Download. New version (updated Feb 2018) "work in progress" (so for evaluation...) written in C#, which will be extended to edit styles. Also offers a.o. export to CSV. I am not 100% sure if I fully understand how all data in the tables should be interpreted (but it seems to work well). So... your feedback is always welcome. Curious about what is inside a PC3, PMP, CTB, STB file? Perhaps even need the info, for instance to compare files, or for trouble shooting? 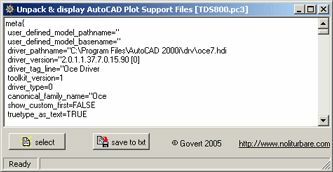 Starting with AutoCAD 2000 these support files for plotting/printing are compressed. As Autodesk did not disclose how they compress, there was no way to read the real content. There was... until I figured out how they compress the CTB and STB files (see PlotStyle viewer above). PC3 and PMP files use the same compression, so it was relatively easy to create an "unpack" tool. This simple tool will extract the compressed data from these files to a text file that can be analyzed and compared "off-line". I also created this very experimental program that reads and writes (the latest release includes an MDI version, for easy comparison and drag and drop between document windows). It lets you edit the content of support files and write it back in the format that AutoCAD can read. Its main purpose is that I demonstrate that it is technically possible to do it. To really edit these files you will have to understand the structure. Use it with care!